"That's how I knew it was radical vegans," she told AFP. Incidents of vandalism and intimidation have reached such a level that the country's butchers' confederation, representing 18,000 businesses, sounded the alarm publicly in June and asked the government for protection. "Since the start of the year, we've seen 17 butcher shop windows destroyed and dozens of acts of vandalism," Jean-Francois Guihard, head of the CFBCT confederation, told AFP. "The state needs to take necessary steps," he said, characterising the campaign against meat producers as a "form of terrorism". Overnight on Thursday-Friday, an abattoir in the east of France was partly burned down, again raising suspicions that anti-meat campaigners could be responsible. The heads of the cattle and pork associations, Interbev and Inaporc, issued a joint statement on Friday urging President Emmanuel Macron to intervene and even warning of a "civil war" over the issue. 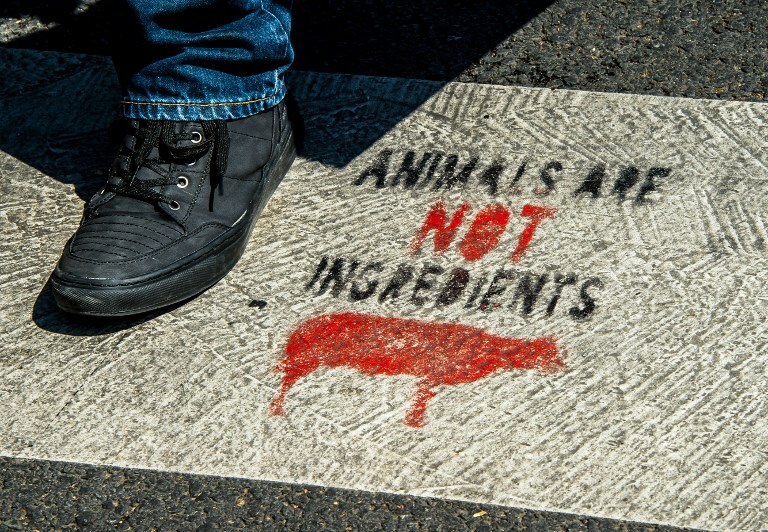 Although no groups have been blamed for the recent attacks on butcher shops, activist networks such as L214, 269 Life France or Boucherie Abolition are at the forefront of these more muscular tactics. The latter group fights "for the abolition of the genocide called butchery," its spokeswoman Solveig Halloin told AFP. "Animal breeding ds of rearing animals are violent and amount to persecution." Halloin does not say whether her group is behind the attacks on butcher shops, but neither does she condemn the violence. "The extremists in brutality are the butchers," she said. Applying the word "genocide" to the slaughtering of animals -- the term is a specific legal crime applied to the killing of humans on account of their race or identity -- reflects the "speciest" beliefs of radical groups such as Boucherie Abolition. So-called "speciests" reject the idea of an animal hierarchy that places humans at the top, arguing instead that all animals should be treated equally. 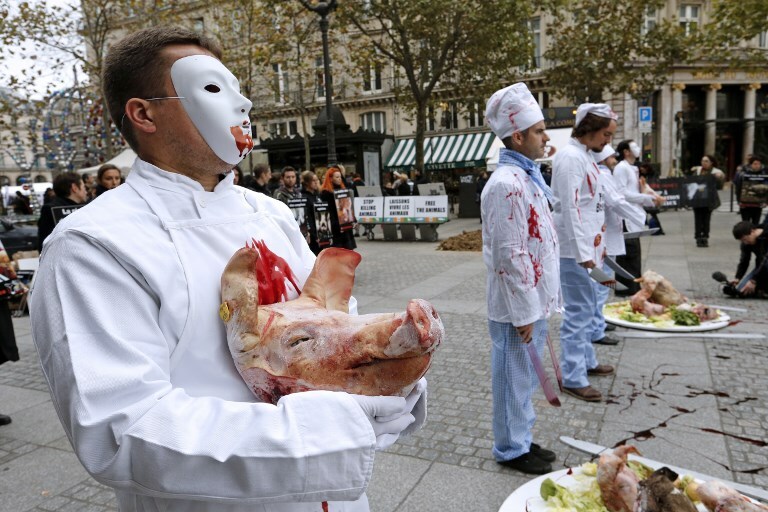 Health scares, higher prices and growing awareness about animal rights have led to a gradual fall in meat consumption in France since the end of the 1990s, but most natives remain proudly carnivorous. In the country that brought the world boeuf bourguignon, coq au vin and foie gras, vegetarianism and particularly veganism remain marginal, with most French children still fed meat four days a week at school. But a small fringe of radical animal rights groups is determined to change attitudes by highlighting abuses and cruelty in the farming and meat industry. Traditionally their campaigns have involved handing out leaflets or organising demonstrations, but in recent years they have turned to direct action, invading abattoirs or throwing fake blood over processing plants. The latter group fights "for the abolition of the genocide called butchery," its spokeswoman Solveig Halloin told AFP. "Animal breeding should not be a career. 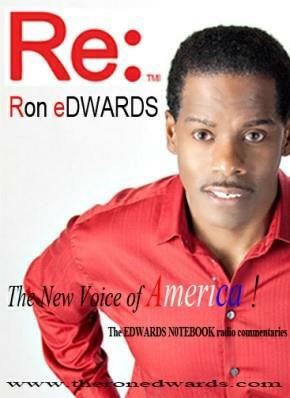 The methods of rearing animals are violent and amount to persecution." 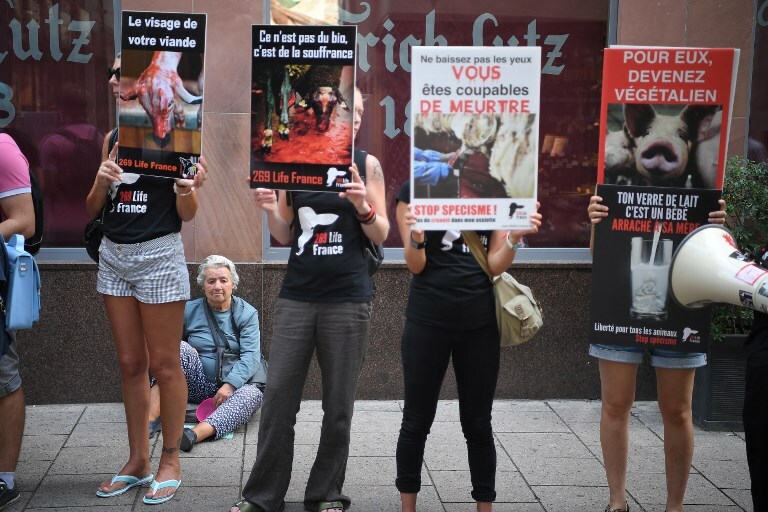 Last Saturday, Boucherie Abolition and 269 Life France organised demonstrations in front of dozens of butchers' shops across France. In Paris, Vincent Aubry and another campaigner carried around a young pig -- which are prized for their tenderness when roasted. Aubry did not condemn the smashing of butchers' windows either and he said he was "prepared to go to prison if needed." "Our only limit is violence against human beings," he said. The risk of confrontation between those who depend on rearing and slaughtering animals for their living and those who are determined to stop what they consider to be mass killing appears to be rising. The CFBCT confederation accuses the vegans of "wanting to impose on the immense majority of people their lifestyle, or even their ideology." Marianne Celka, a researcher at the Paul-Valery University in Montpellier in southern France, sees "no chance of conciliation" between the two sides. But she highlights how veganism is gaining ground in France, with some major supermarkets now stocking "100 percent vegan" products -- sometimes opposite their meat aisles.